After the yearly spawning months at Admiral's Point in Newfoundand Labrador, the surviving Capelin will move off the beach and back into the deeper water. The Capelin eggs remain on the sand and gravel for about fifteen to twenty days where they will hatch. The larvae will stay in the gravel for a short period of time where their survival rate will depend on the action of the water along the beach and the temperature of the water. 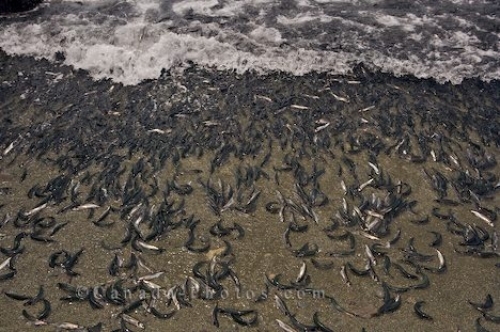 Picture of the busy spawning Capelin on the beach at Admiral's Point in Trinity Bay in Newfoundland Labrador.